A cataract, an eye disorder mostly affects elderly people. In this disease, patient experiences clouding of the lens portion of the eye. The result is much like smearing grease over the lens of a camera and makes worse normal vision. People above sixty years are more prone to this disease. It occurs when the normally clear, aspirin-sized lens of the eye starts to become cloudy. A cataract forms in the eye's lens. The lens focuses light on the retina, the light-sensitive membrane at the back of the eye which converts light impulses into nerve signals to produce clear visual images. Anyone who developed cataracts and required surgery faced a procedure that involved pain and often less than satisfactory results. Due to advancement in medicine, cataracts are less troublesome. Today, the clouded lens is surgically removed and replaced with a plastic intraocular lens in approximately one hour operation and patient is not hospitalized. 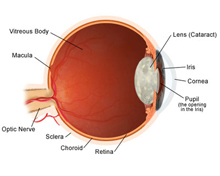 The reason of most cataracts is change in the chemical composition of the lens. In few cases, the chemical changes are due to hereditary enzyme defect, trauma to the eye, diabetes, or use of certain drugs, such as the steroid prednisone. Cataract can develop very slowly that a person is not aware of disease. If the cataract is on the outer edge of the lens, no change in vision may be visible. Cloudiness near the center of the lens, however, frequently interferes with clear vision. Cataracts take place in three types. A nuclear cataract occurs in the center of the lens. 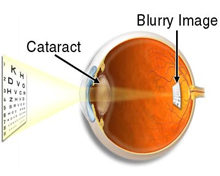 In this type of cataract, as the lens changes the way it focuses light, patient may become more nearsighted or even experience a temporary improvement in his reading vision. Some people do not require their glasses. Unfortunately, this second sight disappears as the lens gradually turns more densely yellow and further clouds vision. These are the signs in early stage of cataract. As the cataract progresses, the lens may even turn brown. Patient with this type of cataract have problem in seeing in dim light and driving at night. Advanced discoloration can lead to difficulty in differentiating between shades of blue and purple. Another type of cataract is cortical cataract which begins as whitish, wedge-shaped opacities or streaks on the outer edge of the lens cortex. As it gradually develops, the streaks expand to the center and obstruct with light passing through the center of the lens. Pateint have problems with glare. A subcapsular cataract begins as a small, opaque area just under the capsule of the lens. It generally forms near the back of the lens, right in the path of light on its way to the retina. Patients with subcapsular cataract have difficulty in reading vision. It reduces vision in bright light and causes glare or halos around lights at night. Many researches have been done to find out the root causes of cataract but researchers fail to identify exactly why a lens changes with age. One of the possible causes may be damage due to unstable molecules. Smoking and exposure to ultraviolet light are two sources of free radicals. General deterioration on the lens over the years also may cause the changes in protein fibers. There are numerous factors that increase risk of cataracts. These are age, diabetes, family history of cataracts, previous eye injury or inflammation, previous eye surgery, prolonged use of corticosteroids, excessive exposure to sunlight and exposure to ionizing radiation Smoking. Symptoms: Patients of cataract complaint double or blurred vision, sensitivity to light and glare such as bright sun or auto headlights, less vivid perception of color, and frequent changes in eye-glass prescriptions. When the cataract is in critical stage, even high power glasses does not improve sight, although holding objects nearer to the eye may help reading and close-up work. The pupil, which normally appears black, may undergo perceptible color changes and appear to be yellowish or white. Diagnosis: Medical practitioners diagnose cataracts through a medical eye examination. The doctor can observe the abnormal lens using a hand-held viewing instrument (ophthalmoscope). The usual test for visual acuity, the letter eye chart, may not, however, reflect the correct nature of visual loss. Numerous tests which measure glare sensitivity, contrast sensitivity, night vision, color vision, and side or central vision may assist the diagnosis. It has been observed that in most cases, cataract is associated with aging and develop slowly therefore many patients may not observe their visual loss in early stage and this disease become severe. Some cataracts remain small and never need treatment, others grow more rapidly and progressively larger. Doctors recommend surgery when a cataract seriously interferes with normal activities. People who depend on their eyes for work, play and other activities may want their cataracts removed earlier than those whose daily life is different and they do not use eyes for work and other important activities. Treatment options: The treatment for cataracts is surgery by removing the clouded lens, which generally includes substituting the lens with a clear lens implant. 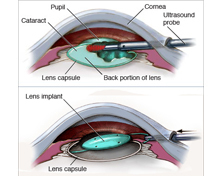 In some cases, cataracts are removed without reinserting implant lenses. In these cases, doctors recommend eyeglasses or contact lenses to correct the vision. Cataract surgery is very common and ninety five percentages of surgery cases are successful. Doctor advice surgery when cataracts begin to affect your quality of life or interfere with patient's ability to perform normal daily activities. Surgery is done on only one eye at a time. It's generally done on an outpatient basis, usually with local anesthesia. Patient with cataract operation recover fast. They can often continue normal daily activities beginning the night of surgery. Medication, dietary supplements, exercise or optical devices can not be used to cure this disease. There are some precautions that must be taken after operation. It is usually seen that after the operation, most people progresses very fast and their sight improves but the fact is that complete healing may take several months. Patient is advised to wear glasses, especially for reading, because the new intraocular lens implant is normally set up for distance vision and not close-to vision. Patient with cataract surgery are instructed to pour eye drops for up to two months after his operation. They must follow doctor's advice in order to recover completely. Patients who are operated often discharged same day and resume routine work but they have to be very careful and take precautions. They must avoid rubbing their eye; discuss wearing an eye shield with hospital staff if they are a restless sleeper, don't do any very heavy lifting, and avoid strenuous exercise and swimming, take care if it is windy, in case anything blows in their eye, take care washing their hair; avoid getting soapy water in eyes, avoid wearing eye make-up until the hospital are satisfied with recovery. Though patients with cataract surgery do not face any problem in most of the cases but two per cent of patients have serious, unexpected complications. If patient experiences some unusual signs after the operation, he must contact eye surgeon immediately to overcome problem. One of the most common and easily curable complications is a thickening of the lens casing the part of the eye that holds the lens in place. Laser treatment is the best way to correct this problem. There are some home remedies which person can adopt to overcome cataracts until he decides to go for surgery. If person is wearing eyeglasses or contact lenses, he must make sure they are the most precise prescription possible. It is recommended to use a magnifying glass while reading. People must live in well ventilated with proper lighting home. They must have more or brighter lamps. When they go outside during the day, they must use r sunglasses to reduce glare. They are advised to avoid night driving. When vision loss starts to hamper with their daily activities, they immediately consult eye surgeon. People should never take cataract as an ordinary disease. Some preventive measures may be helpful in maintaining good health. People must go for regular eye examination and if there is any difficulty, it can be detected earlier. If person is over age 65, make schedule for eye exams at least every other year. Mostly cataracts occur with age and people can not avoid the surgery. They can take preventive steps to possibly prevent the development of cataracts. They should not smoke. Smoking produces free radicals, increasing risk of cataracts. Always take a balanced diet. In diet, person must take plenty of fruits and vegetables. This will help to prevent cataract development, though this is not proven technique to avoid cataract. Person must protect himself from the sun because ultraviolet light may contribute to the development of cataracts. If there are other health problems, get treatment immediately. Much of the researchers are making their great efforts to discover new ways to avoid and treat cataracts, such as developing medications that would reduce the need for surgery. Today there are no option of treatment other than surgery therefore prevention must be taken to reduce the harmful effect. Note: This information is just for knowledge of disease. If such type of medical condition develops, consult your doctor.